Dolls Party in LA 4 2019 | VOLKS USA, Inc.
Information, Registration, Event, Shop, Beauty Salon and Tea Party has been updated. Dolpa Dealer’s Market has been updated. Copyright © ZOUKEI-MURA INC. | VOLKS INC. All Rights reserved. 「創作造形©ボークス・造形村」 ©1998-2019 VOLKS INC. All rights are reserved. 「創作造形©ボークス・造形村」 ©2003-2019 VOLKS INC. All rights are reserved. 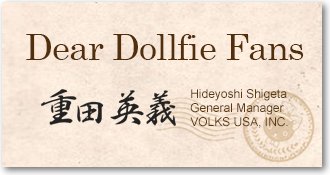 Super Dollfie® and Dollfie Dream® is a registered trademark of VOLKS INC. This September, we are very excited and pleased to be able to hold Dolls Party in LA in Anaheim! Because of everyone's warm, heartfelt support for Dollfie®; we have been able to successfully prepare this special event! To all the Super Dollfie® and Dollfie Dream® fans who plan to join us at Dolls Party - we hope that you treasure this exciting day! Please come and visit us at Dolls Party in LA on September 7-8, 2019. We sincerely look forward to seeing all of you at the event. Additional details of the event will be announced at a later date.